Spend an initial evening in the company of Edwina Hayes and you will feel like you’ve known her all your life. 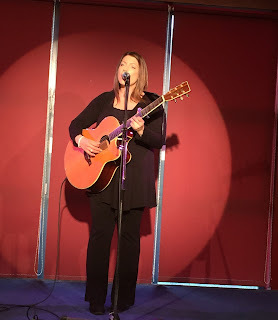 While this was technically not the first time catching Edwina live, that experience was when she assisted The Kennedys for their Nanci Griffith tribute evening last year in Birmingham, it was a debut occasion for a full solo show. She is a well-known artist on the UK folk and acoustic scene, mainly through her extensive gig endeavours with more than a little help from a sprinkling of angelic dust that coats every note extracted from her vocal chords. Of course throw in the side dish of being one of the most warm, friendly and affectionate performers to share their songs in public and a wrong of being aware of Edwina for over ten years without encountering the full live experience has been corrected. 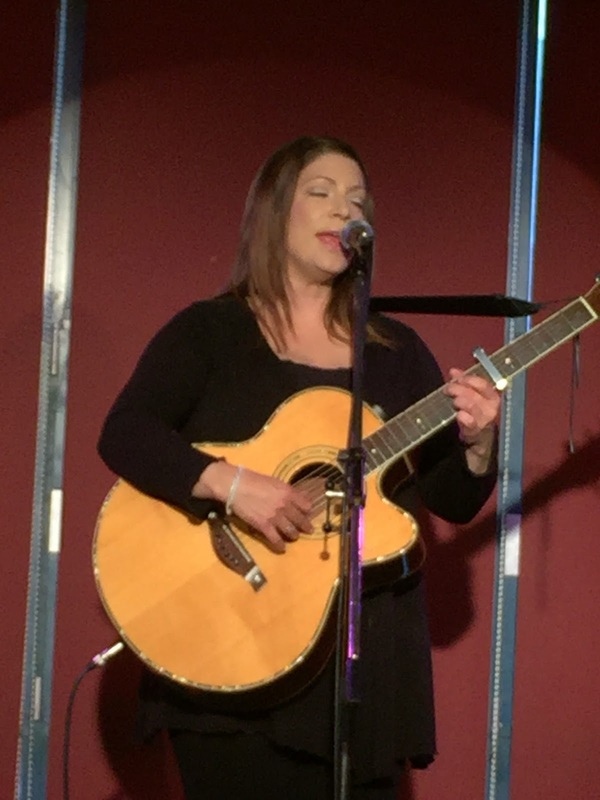 During the 21 years that Edwina has ventured down the performing road, she admits to not being a prolific song writing and recording artist, but this is more than made up by a magical ability to engage through the tale and anecdote. Humility and appreciation is abounding as she exudes gratefulness in being granted the opportunity to make music her living. This has led to trips far and wide including a recent one to Australia, which was a common theme to much of tonight’s inter-song banter. Closer to home Edwina continues to frequent a vast range of gigs stretching from house concerts and anniversary bookings to opening in large venues for artists such as Fairport Convention, Cara Dillon and Squeeze. From her own songbook, Edwina’s signature tune is the delightful ‘Pour Me a Drink’, the title track to one of her albums and written in the honour of her somewhat eccentric and colourful late father. ‘Nobody’s Coming Around’, ‘Leave a Light on for You’, ‘Bend in the Road’ and ‘I Won’t Say Your Name’ were amongst the original compositions selected to populate the standard gig format of a couple of 45 minute sets. An added part to tonight’s show was Edwina inviting a young 15 year old singer-songwriter by the name of Eve Singleton to play two songs at the start of the second set and with plenty of evidence to support the view, Edwina was enthusiastic in her praise. With such as beautiful voice, Edwina is born to sing the works of the great song writers without the baggage of being a formulaic covers artist. A fair number of the songs chosen for tonight’s show were pretty standard such as ‘Don’t Think Twice’, ‘Annie’s Song’, ‘Down Where the Drunkards Roll’ and the immaculate ‘Will You Still Love Me Tomorrow’. The left field cover was a song from American artist Jon Byrd (not to be confused with Jonathan Byrd who’s been currently touring) with his self-penned ‘Stay’, while Edwina does not shy away from the works of the more complex songwriters as shown in covering Leonard Cohen’s ‘Famous Blue Raincoat’. Perhaps the cover song that has opened more doors for Edwina is her version of Randy Newman's 'Feels Like Home'. As you would expect, virtually every song had an informative introduction with John Prine’s ‘Speed of the Sound of Loneliness’ being chosen on the basis of performing it live with members of Fairport Convention. Edwina’s adulation for Richard Thompson extended to several mentions of meeting him in Australia and an added version of ‘From Galway to Graceland’ was included in the first set. Staying on the contemporary UK scene but switching genders and moving down the age scale, Kate Rusby cropped up in conversation. Edwina spoke excitedly about playing at her festival later this summer, whilst serenely delivering the traditional number, ‘Botany Bay’, coincidently a song given a Kate Rusby re-working. 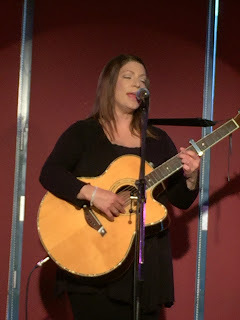 You would be hard pushed to replicate the love, affection and sheer down to earth persona as shown by Edwina Hayes in an intimate gig setting. Fame may be a fleeting visitor but to each one of her fans the most important thing is the personal connection and outstanding music experience. Over the years, folks who have not seen Edwina live are becoming a dwindling number and if you are one of those persons, there will be plenty of opportunities to amend the omission in the future.